REFLECTING BACK AND LOOKING FORWARD…..
Wishing my family, friends, and followers health, happiness and prosperity in the year to come. Looking back to 2016, I count my blessings. 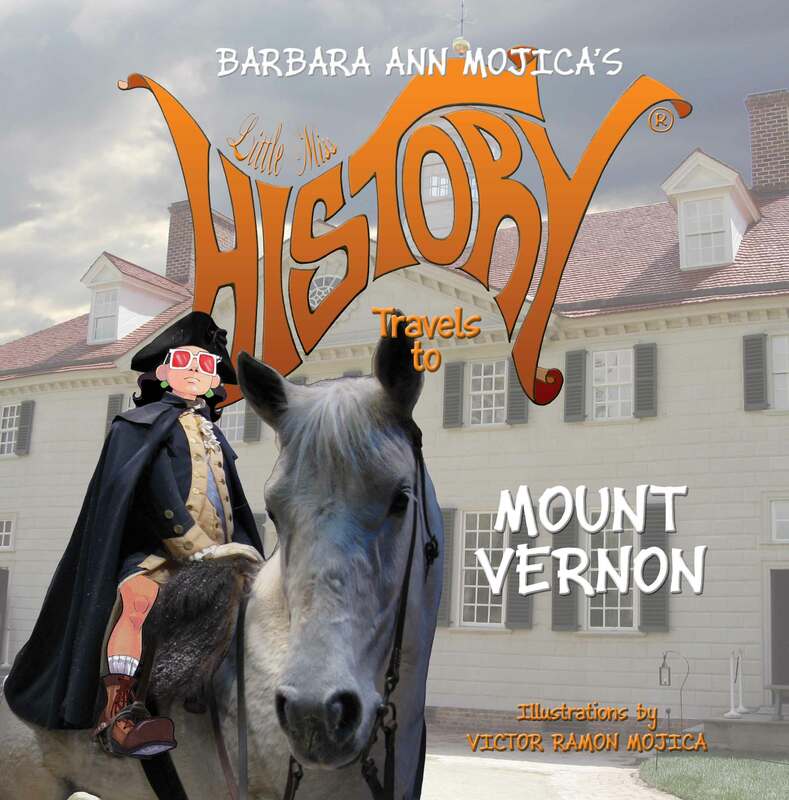 I released the seventh book in the award winning Little Miss HISTORY Travels to….children’s nonfiction book series, Little Miss HISTORY Travels to MOUNT VERNON. Little Miss HISTORY and I traveled near and far to visit old friends and acquire new ones. I’d like to share a few memories with you…. 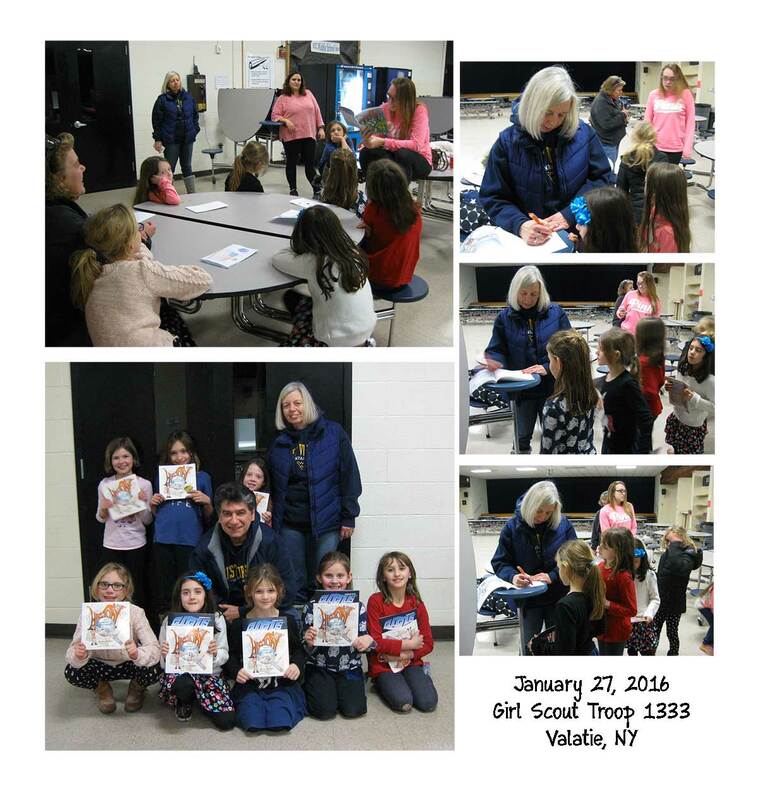 In January, we assisted a local girl scout troupe working on earning their community badge by reading about Little Miss HISTORY’S trip to The Statue of Liberty. 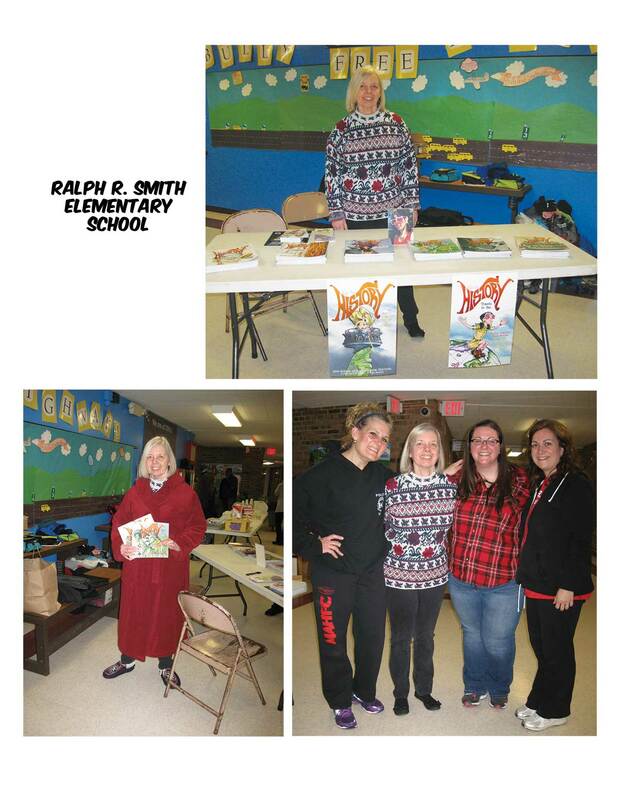 We participated in READ ACROSS AMERICA in March with our friends at Temple Hill Academy in Newburgh and had a pajama reading party at Ralph R. Smith Elementary School in New Hyde Park. 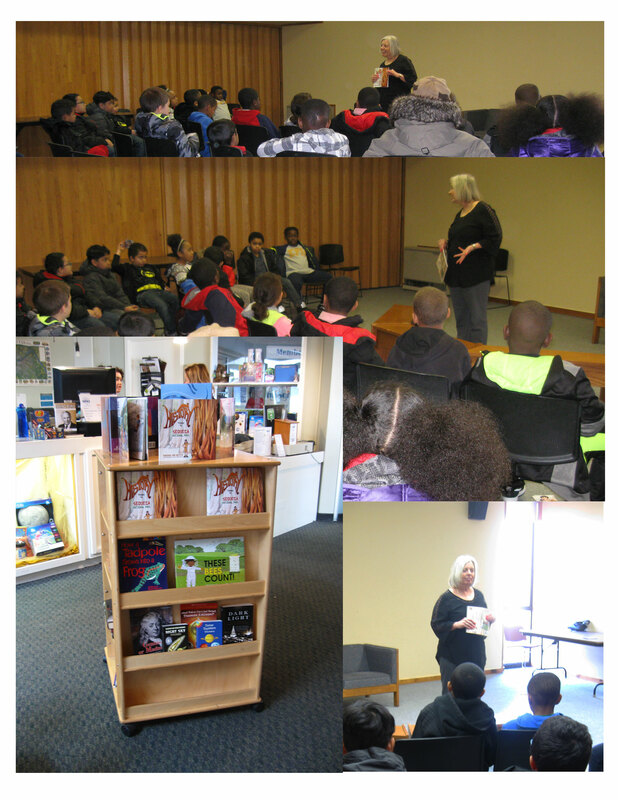 One of the highlights each May is Children’s Reading Week. 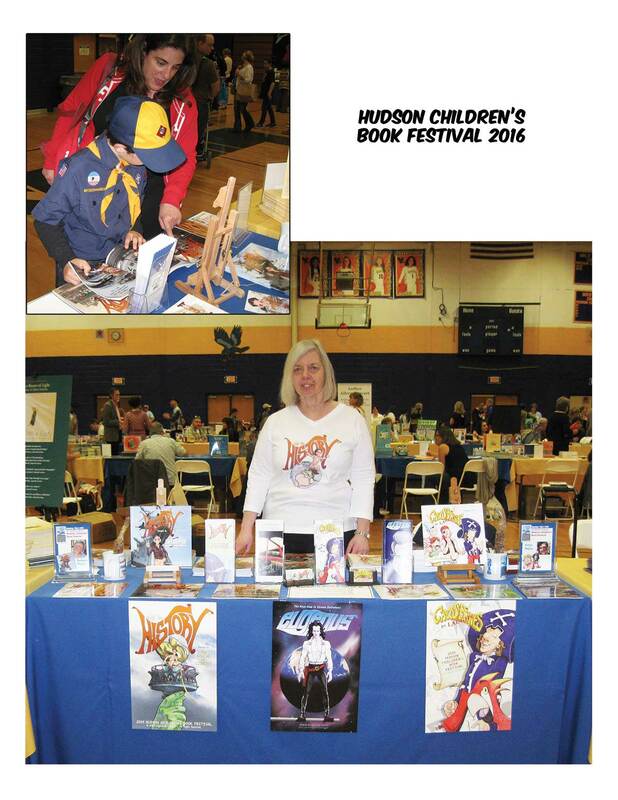 Little Miss HISTORY Travels to Intrepid, Sea, Air & Space Museum was my feature book in 2016 at the Hudson Children’s Book Festival, the largest children’s book festival in New York state. We journeyed to the Museum of Science and Innovation in Schenectady to read about SEQUOIA NATIONAL PARK at the four day Science and Technology Festival. 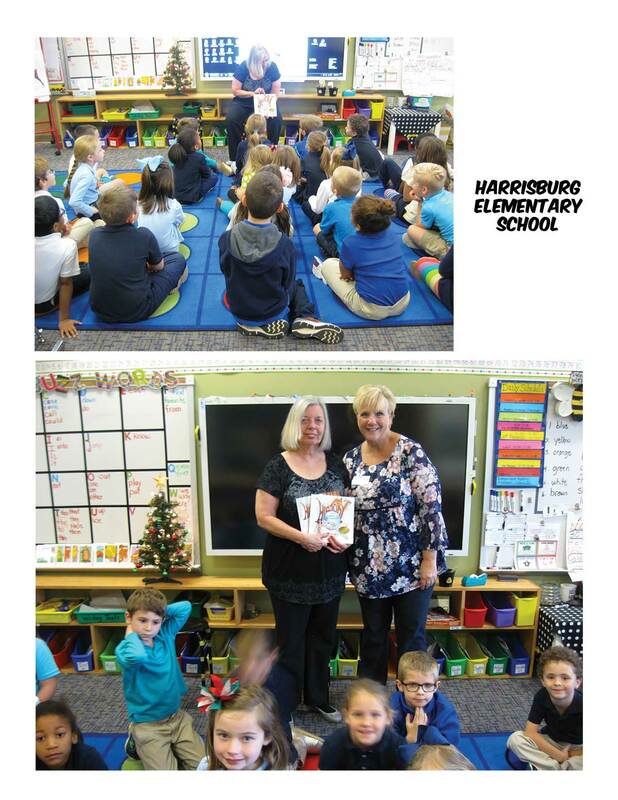 For Thanksgiving I traveled south to the Carolinas to visit with family and read to first grade children at Harrisburg Elementary School in South Carolina. 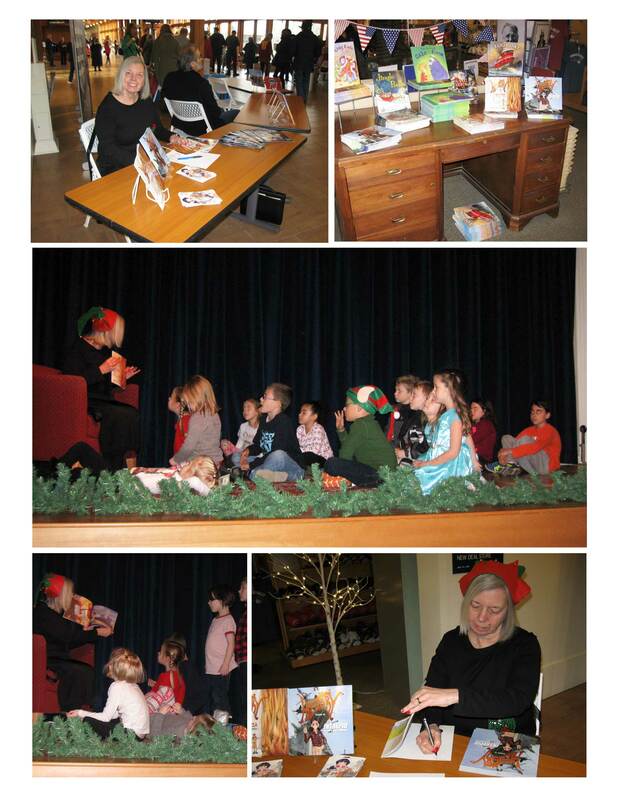 I welcomed the opportunity to share in the holiday spirit with authors Iza Trapani and Michael Garland at FDR’s home and presidential library in New Hyde Park for the Children’s Holiday Reading Festival in December. As 2016 comes to a close, Little Miss HISTORY has plans to travel to new and exciting destinations by some unconventional means of transportation. 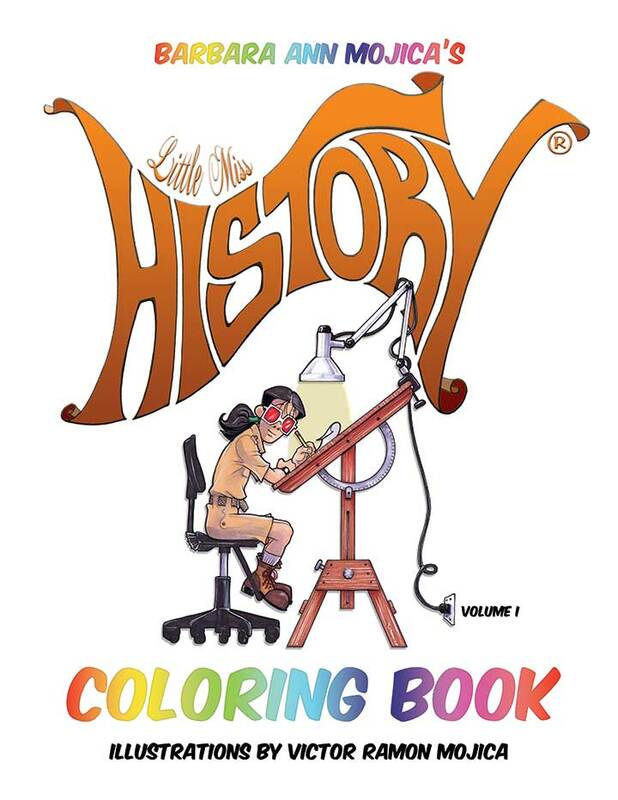 I hope that children and adults will enjoy a new opportunity to put their creative stamp on the adventures of Little Miss HISTORY. In just a few weeks, her very first coloring book will be available online and in your favorite bookstore. 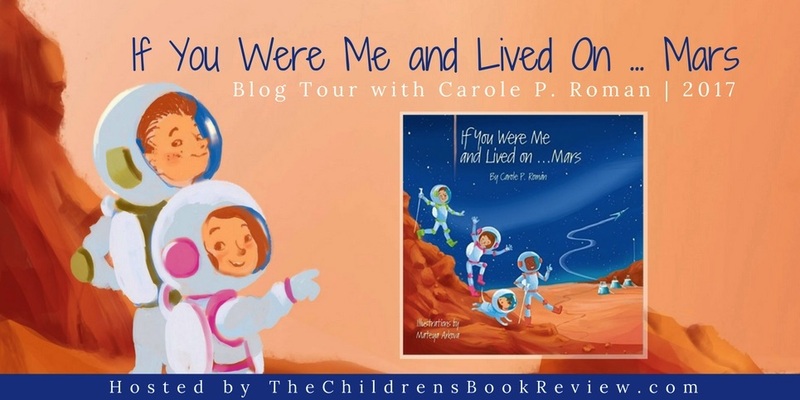 You can add your personal touch to images from her adventures and read words of wisdom from historical figures. Take a sneak peak at the cover! 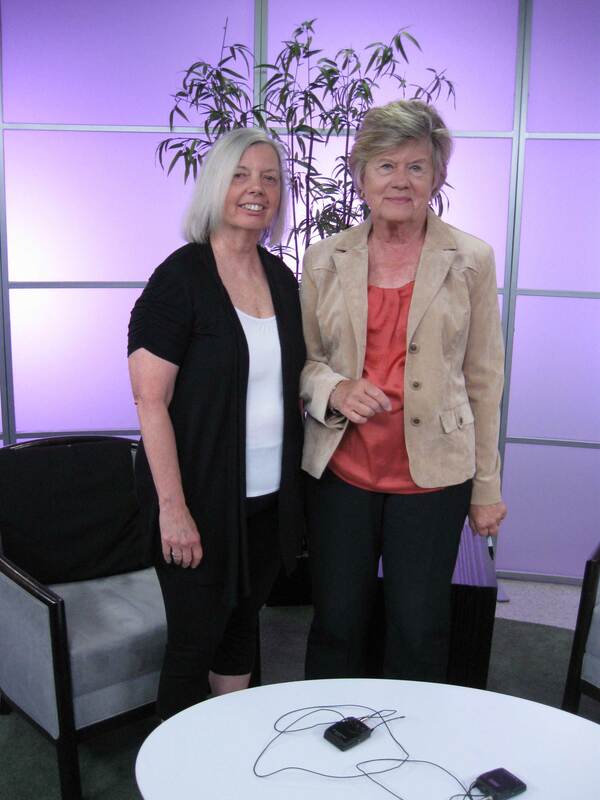 Please continue to follow my family friendly book reviews for ages preschool through adult on Wednesdays and Sundays. To subscribe click on the word Follow or hit the orange RSS FEED button in the upper right hand corner of this page. Look out 2017, here we come! What was it that inspired you to write a book about happiness? For many years I used to run a mother/daughter book club at my home and no matter what story we discussed, whether it was Tolstoy’s, “The Two Brothers,” or a classic fairy tale such as Jack and the Beanstalk, it seemed we always circled back to this whole notion of happiness. What was it? How did our main character find it….or lose it? Were rich people happier than poor people? These were the kinds of questions we grappled with. Around this time, I also noticed too that there was a bounty of books on this topic and one of them, The Pursuit of Happiness by William O’ Malley referred to the ancient Greek definition of happiness as the evolving of a soul. This description resonated deeply with me, because of course, happiness is never actually static, but rather continually unfolds and evolves over time, and seems much more connected to the interior life than the exterior life. O’Malley also mentioned watching his Golden retriever swimming in a pond to retrieve his ball, and how the dog would literally continue swimming and retrieving to the point of utter exhaustion. Why? Because he was in his element – doing what he was born to do, to swim and to retrieve. That was my “Aha” moment, because it seemed to me that we humans are born to do two things -to love and to create. And what can be more loving and creative than – MOTHERING! 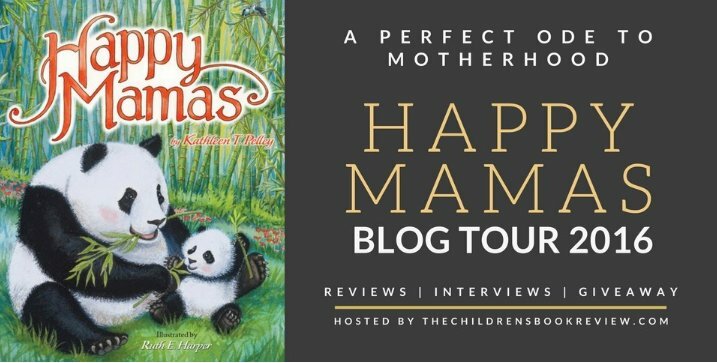 I wrote Happy Mamas as a way of exploring the myriad ways human and animal mamas love their babies over the course of a day and to show how mothering and happiness are inextricably entwined. Any mother will tell you that what she wants most in all the world is for her child to be happy – and that happiness is completely and absolutely related to – GOODNESS – to the evolving of a soul. The animals included within the pages of Happy Mamas are all so adorable. Do you have any favorites? It’s hard to choose which animals in the book are my favorite as Ruth has done such a fabulous job of depicting all of them in various kinds of cheery cavorting, but probably, if I had to choose, then it would be the wolves singing their serenade to the man in the moon, “to make him smile and light up the night!” I love how Ruth has painted them perched on the desert rocks and howling their little hearts out. It has such great child appeal as most children naturally enjoy singing together and in those early years, seldom do they suffer from any inhibitions about the quality of their voices – they just sing away with great gusto. You have been writing children’s books for quite some time. Do you feel that storytelling has changed over the years? What lessons have you learned through your experiences as a writer? At the risk of sounding cynical, I think the hardest thing I’ve learned is – adapt to the market place or suffer the consequences! 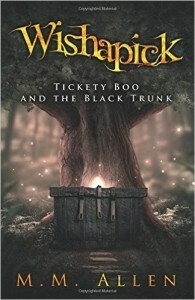 Early on in my career, I loved writing stories with a folk tale/fable like feel to them, with rich lyrical language that could appeal to children as old as 10– these were the kind of stories I liked to read to my class when I was a teacher in Scotland, and the type of stories I shared with the children at the inner city school where I worked for over twenty years. 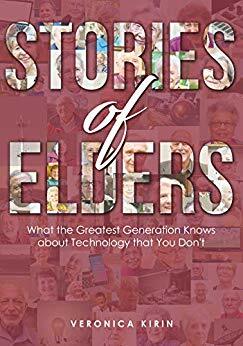 But – they are NOT the type of stories publishers want now. The industry has changed so much since then and now most picture books have little or no text and are very visually driven and geared to the 3- 6 year olds. Hence my most recent book – Happy Mamas is geared to this age group AND their mothers – I think one of the great joys of a picture book is they allow adult and child to bask in the beauty of the language and even if children do not understand the meaning of a word, it should not matter one whit as long as they enjoy the experience of sitting in a lap with a Mama’s soothing words seeping into their little souls. Ruth E. Harper is a talented illustrator. Together you have created a wonderful keepsake book. DO you have a favorite part? Children are always surprised when I tell them I always have a favorite part of my books. But because I am not the illustrator and seldom have that much control over the illustrations, it is often a surprise to me when I see the final pictures and there is always one illustration that resonates with me deeply. In this book it is the picture of the adorable Asian big sister picking up her baby brother to “kiss him better.” To me, this picture illustrates the most important lesson any Mama can teach her child – how to love. What do you hope readers will take away from reading Happy Mamas? Picture books distill some truth or beauty to its finest essence and so after that last page is turned or final word uttered, some bolt of beauty or some whiff of wonder should linger with you. I think the essence of Happy Mamas is simple – all we really want for our children from the moment we first hold them in our arms to the day we send them out into the world on their own (and beyond) is for them to – BE HAPPY. The endearing picture of a Happy Mama panda feeding her little one on the book’s cover is a perfect embodiment of this truth, for the first act of mothering is – to feed our babies, be it bamboo sticks or bottles of milk. And at the same time as we are feeding their bodies, we are also feeding their hearts and souls with – our love. If you look at the faces of the Mama panda and her baby on the cover, I think you will agree that Ruth has managed to capture perfectly that moment of Mama/Baby bonding bliss. Can you share with us your favorite part of the writing process? Definitely revising. 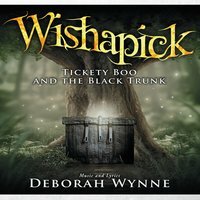 Drafting is so hard because I just never know if this idea I have is going to make it as a picture book, but when I am at the final revision stage, especially if it has made it to my editor’s desk, then I have the confidence to know that it will work and all I need to do is to polish and shine and make the story sparkle. If things go well with Happy Mamas, I would love to do a Happy Papas, but….after some initial research, I realize it is much harder to find Papas in the animal kingdom who stick around to “father” their little ones – but there are some. 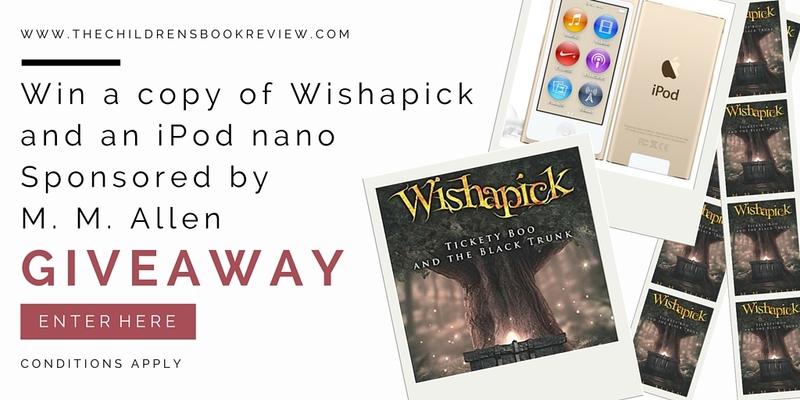 Is there anything else that you would like to share with your readers? 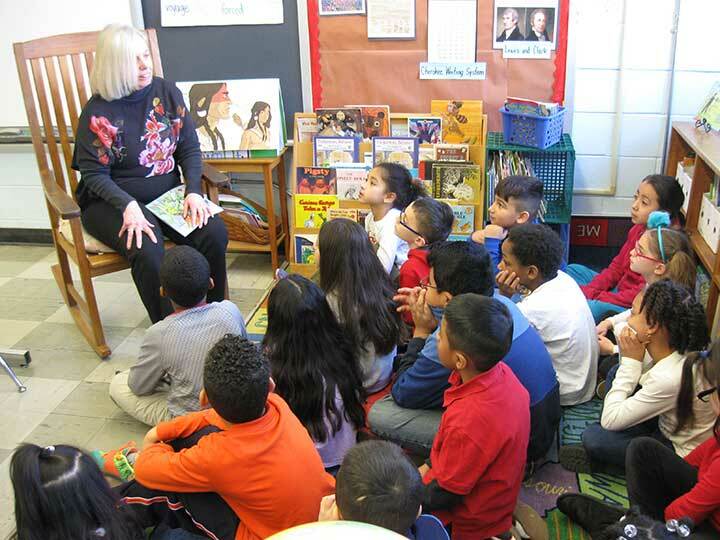 When I talk to parents and children at literacy events, I like to emphasize that learning to be a good reader/writer is not only important because it means better grades, improved listening skills, entering good colleges and getting good jobs – important as all of those are – it is about being a happier person and living live more compassionately, creatively, and joyfully. Our job as parents, storytellers, and educators is to raise the future heroes and leaders of our world and so we need to give them models of courage, compassion and goodness by feeding them GOOD stories. “All of earth is crammed with heaven.” Elizabeth Barrett Browning. 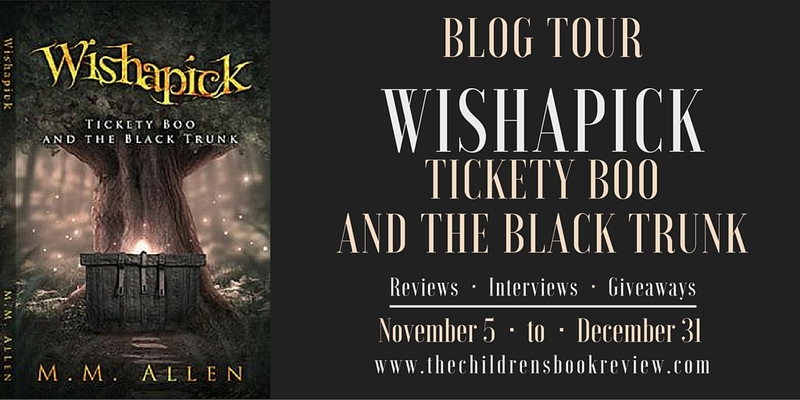 The best part about being a children’s author is rummaging around my day for a piece of heaven and then writing about it!